Hi, I am interested in your 1964 Chevrolet Corvette (stock #1699-TPA) listed on Autotrader for $38,995. I'd like to get more information about this vehicle and confirm its availability. 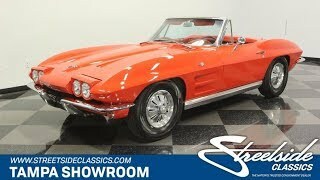 The 1964 Chevrolet Corvette is one of the most iconic American classics around. So when you can get your hands on a droptop with strong V8 power, four-on-the-floor, and all wrapped in red all for a value price then you know youre looking at an attractive deal. The Sting Ray is a legend on wheels. They used crisp lines to accent everything from the big fenders, to the rear deck. And as you look over the fit of the panels and how the doors close with authority, you can see this is a classic that has been treated with respect. Plus, the red has the right kind of gloss and shine that makes the sunshine-friendly droptop look terrific when youre out cruising on a Sunday. And even on the days when you feel like having the top up, the white roof adds distinction. In fact, the whole car is made to have the right kind of standout details, like bright two-piece chrome bumper front & rear, and the rarely-seen factory wheel covers. While we like the way this one looks with the roof up, it truly looks its best with it stowed away. After all, the red interior gives this an almost seamless flow between the inside and the outside. Youll love the details like the bright trim and working clock. You even have an upgraded AM/FM/cassette stereo for improved driving tunes. Of course, nothing beats that feeling of slipping behind the grippy wood-rimmed steering wheel, grabbing the shifter, and watching the full gauges dance as the motor sings its muscular tune. Under the hood is an era-correct 327 cubic-inch V8. Everything from the condition of the belts to the way this fires up readily tells you it has been maintained correctly. And if you look carefully, youre going to spot some nice power-enhancing upgrades like an Edelbrock four-barrel carburetor and Edelbrock intake. When you take it out for a drive, this classic Corvette loves to really give you the feeling of the road. Plus, you have the right control with everything from the four-speed manual transmission to a fully independent sports suspension. Heres an iconic car with an iconic color combo and a nice price. Its a great deal that will be moving soon. Call today!! !